Inside Storey: Win a Free Copy of One-Yard Wonders! Win a Free Copy of One-Yard Wonders! UPDATE, JANUARY 10: Our winner has been chosen by this Random Number Generator and it is Bobbie23nc. Congratulations! Thank you all for your enthusiastic comments and overwhelming response! This morning, publicist Alee Marsh brought to my attention a fun online event being coordinated by the fabric team at Pink Chalk Studios — a Sew Along inspired by our best-selling book One-Yard Wonders. Over the course of 2011, the team at Pink Chalk Studios is planning to work their way through all 101 projects in the book, in order, a la Julie and Julia — and they are inviting their readers to join in via their blog. What an inspiring way to kick off a crafty new year! 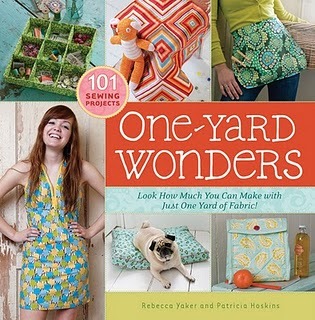 In honor of the Sew Along, we're giving away a free copy of One-Yard Wonders to a randomly chosen winner. To enter, simply leave a comment on this post. The lucky winner will be chosen on Monday, January 10. I have fabric waiting for this book! Looking forward to seeing all the projects come to life! How timely: I just pulled out the old machine to teach the 3 grand kids how to sew! We forgot to mention — MAKE SURE YOU CHECK BACK ON MONDAY!!!! Looking forward to seeing more posts! Oh, and Lynda, that is great you are teaching your grankids to sew! I have lots of 1 yard cuts in my stash and this would be perfect to use it up. I love buying fabric at thrift stores and garage sales, and making things out of them! ooohh...I've been eyeing that book at my local fabric store! How fun! Oh, I've been wanting this book and a sew along sounds like fun! I have the book and love it, but I have a friend who is relatively new to sewing and she would love it! I have been wanting this book for a while now so a friend and I can work our way through it! I would love to win a copy of this book, been trying to afford it for awhile now. I am not working and hubby has been in n out of employment for over a year, would love a free book to be able to make something with only a single yard of fabric! My New Year's Resolution is to do more crafting, so this book would be a great start. I would take such good care of this treasure! Wow I never realised there were that many projects in the book. I would love to win, I have a serious yard stash. would love to win as i'm in need of something to get me back into sewing! Pick me! Pick me! I love the idea of this book! Would love to win this. Thanks. I have seen this book, but have not bought it. What a fun giveaway! Congrats to the winner! What a great idea! I would love to win one so that I can play along! Yay! I'm trying to spend less money in the new year, so I'm hoping I win so I can take part in the sew along! How fun!!! Have wanted to pick up this book for awhile! i can't wait to sew the projects in this book! That book is a perfect match for my stash! What a fun giveaway! Great giveaway . Would love to sew-a-long withthe pink chalk team! i would love to sew along with Pink Chalk! thanks for a chance. Oh wonderful, thanks so much for the chance to win!! Great giveaway -- I'd love to win this book! This book is on my wishlist! It looks so fun! Something that only requires one yard of fabric is something I think I could probably tackle! I'd love to win a copy of this book so I could join the sew along. Thank you for the giveaway! how fun! the sewalong is a cool idea! I'd love to win a copy of this! Thanks for the giveaway chance! Ooh, how I would love to win this book. Thanks for the giveaway! This looks like a fabulous book. Thanks for a chance to win. Been looking for this since a friend had one of your other books- love the small projects! I totally want this book! This is the kind of book I need!!! I have fabric waiting for these ideas to take shape! Pick me and the random pieces of fabric in my closet will finally have a project! I would love to teach my 10 year old how to sew with this book. What a great idea!! What a truly wonderful book, and who does not have 1 yard of this and 1 yard of that in their stash!! I definitely do!! Would love to win!! What a great book. I love the first two project that have already been posted on the blog! This book is on my amazon wish list! Oh yes please, I took this one out from the library and would love to have it in my collection. I would love to win this! Thanks for the chance. I'd love to win a copy of this book. Always looking for more inspiration! Thanks for the giveaway. I'll keep my fingers crossed!! I'm going to do the Pink Chalk Sew Along! It would be great to have the book to accompany it so I can do these great projects! Sweet! Thanks for the opportunity, not only to get a copy of this fabu book, but also to participate in the craft-a-long at Pink Chalk. I'd love to have this book. Seems to have many great ideas in it! I would LOVE to win this book! I love simple projects with minimal fabric needed! Thanks so much for your generosity! This wonderful book has many fun and useful projects. I am sewing again after a long hiatus - and loving the modern projects and fun new fabrics! This book would be a great inspiration! i want to do the sew along sew (pun intended) badly and this give away would make it happen! thank you for the chance to win. This book looks like it's full of great projects! What a great prize! I have SO much unused fabric, this would be so awesome to win!! I would love to win it. Thank you for the giveaway. What fun I could have with this book! I checked out this book from the library and quickly put it on my wish list to own. Thanks! Perfect for my growing stash! Crossing fingers! I really want to do the sew-a-long so I've got my fingers crossed that I can win the book. this book is high on my wish list -- hope I win! This book looks like a great one and I'd love to try some of the projects along with the sew-along. Pick me! Pick me! I've been admiring this book from afar and would LOVE to join in on some of the projects. Thank you so much for the wonderful giveaway! i'd love to win this book, the projects look like so much fun! I've been following the Pink Chalk sew along and think the projects look brilliant. I have so much unused fabric that it would be great to put it to a creative use that doedsnt necessarily involve sewing. I particularly like the week 1 project of the tack board...I definitely need a few of those for my house! I would love to win this book. The sew along is such a fun idea! Gosh I'd love to win this book! Awesome! I just bought a new sewing machine last fall with part of my meager bonus. I just love small projects-so satisfying! Thx for the giveaway. I have been wanting this book forever! Thanks for the giveaway! Sew nice of you to offer us a chance to get in on the sew along with a free book. Thanks for the chance. I've been seeing this book on almost every blog that I follow! So awesome! Great way to become more confident with a sewing machine - one yard at a time. Awesome! This book looks so fun. I would love a copy. Crossing my fingers! Thx for the giveaway. I got a sewing machine for my birthday this year, and am learning to sew. My friend, and fellow sewing enthusiast, says this books is a MUST have! It was on my Christmas list, but I didn't get it! Would love to have a copy! I hope I win! I haven't made anything from the book yet but the Sew Along is totally inspiring me already! I've loved everything I've seen from this book...would absolutely love to win a copy! ooooooooooooooh, I LOVE LOVE this book, I'd be over the moon to win a copy!! Oh, what an opportunity! My vintage collection of fabric needs some serious inspiration! I have 101 yards of fabric; I'd like to play along! I have 101 yards of fabric (or more); I'd like to play along. This looks like such a fun book...I can't wait to see all the projects. Looks like a lovely book - I'd love a copy! Oh no!! I think I'm gonna need this book! Thanks for giving it away!! Oh what a joy it would be to win this! I hope I win this book. I love to get new ideas and this book looks like it has very creative projects. What a great give away...I've been wanting a copy of this book! This is my kind of book! I would love to win! Thanks for the offering this giveaway. Great book--a friend has it and we made the cat bag out of it with our kids. I'd love to have my own copy! I've taken this book out of the library and added it to my list of books to buy. So many wonderful projects! I'd love to win! I was looking at this in the store the other day and realized that I really want this book! I would love to win it! I would love to have this book! Thank you for offering a giveaway to go along with the Sew Along. I love Pink Chalk Fabrics and this book looks great! Thanks for the great giveaway. I'd love to win a copy of this book. It would be great in my collection. I 've absolutely been wanting to get a copy of this since it first came out. I'm crossing my fingers for the win. what is the secret of one yard? Woohoo! I wanted to join in on the sew-along, but I don't have a copy of the book! I've been wanting a copy of this book for a while! Would be great to follow along as they work throught this book. I have a great selection of fabric that would be perfect. thanks for the chance to win. I've had my eye on this book for a while. Thanks for the giveaway! I would love to have that book! Just saw this book for the first time. Can't wait to get it! I would love, love this book! Thanks for the generous opportunity! I have this book, as does my best sewing buddy, and we ADORE it! I would love to win one to give to my mom, as she got me started in sewing, but hardly ever splurges on herself. Please please pick me, I have my fingers crossed my toes too. I want to join in the crafty fun. Thanks for a wonderful chance. I have had this on my wish list for so long! Thanks for a chance to win! I have always wanted to get this book, but I haven't be able, this is my chance and, of course I will love to enter the sew along. Have been reading about this book. It looks so very interesting. Lots of projects to keep me busy. This looks like a great book and just in time for Pink Chalks event! Thanks for the inspiration and your generosity! awesome!! This book is on my wishlist!! I need a book like this...it might help tackle all the one yard stash fabrics I have aquired! Oh I would love to own a copy of this book! I've heard and read so many things about this book and would love to own it! what a fabulous concept for a book! I'll cross my fingers and toes and hope I win. This is 'sew fun'. It's amazing what you can do with a simple yard of fabric. This would be super awesome to win! fantastic, I haven't got it but I have drooled over it at different times! I have so many one-yard pieces of fabric in my stash that this book would be perfect! What a great giveaway - it looks a great book, I'd love to win it! I've popped across from Pink Chalk Studios. What a delicious book! Oooh, I got a new machine for Christmas, this would make for wonderful inspiration! What a great idea! I love the Pink Chalk blog. Maybe I'll win one! I love the Pink Chalk blog and would love to win this book!! I'd love to win a copy - of course I would be checking that I could make the projects with 1 metre of material!!! This book is on my wish list! I have tons of fabric waiting for the projects! I did look with interest to the sewalong when I realized I needed the book (which I don't have..). So thank you very much for the chance to win it! That sew-along is such a great idea! It will be very inspiring to see everyone's projects! I had this book in my hands at Barnes and Noble last month and was sorry afterward that I didn't buy it. So, now maybe I can win it! Thanks for counting me in. I have been eyeing this book for a while now. It looks like it is such a useful book. I have been eye-balling this book everytime it pops up in my google reader and the colors are beautiful!!! I would love to win this book and make everything in it. Thanks for the opportunity! Thank you for such a great giveaway. The book looks wonderful! Wow, what a great way to spend 2011 sewing and learning how to do all those great projects and making new friends too. I would love to win a copy. Thanks for providing this opportunity! What a fun idea. This might just be the motivation I need to get back into my sewing room and off the couch. Thanks for the chance to win this book. I would love to win a copy of this book so thanks for the chance! The Sew Along sounds like fun. Only problem is that I don't have a team to help me sew them all in one year. I would LOVE a copy of the book! It would inspire me, to no end, to WIN your book of sewing inspiration! Love this concept, a greatidea all in one book. Now that sounds like a fun idea - would love to play along! What a tempting suggestion. I will give it a try and join! Wow, this would really kickstart my sewing for the year. Time to use up all the stashed fabric. This would be a lovely way for me to do some simple projects with my 9 yr old who is a new sewer! teaching my granddaughters age 8 and 6 to sew! would love to win! thank you for doing this! What a great idea for a book! Wish I'd thought of it. This book meets such a need in my sewing. I love to make handmade gifts and I tend to buy my fabrics in one yard increments. The sew along for this book at Pink Chalk Fabrics is a super idea, too. This book has been on my wishlist for sometime! I've been wanting to get this book ~ thanks for the chance at winning it! The book looks like so much fun. We all have 1 yard stashes in our sewing rooms and this book looks like a great way to use some of them up. I'd love a copy of the book. Thank you. I'd love a copy! The Sew Along looks fun. I've checked this book out from the library but would LOVE to have my own copy. Wow.. that is awesome thanks! I would love a copy! I've been following the Pink Chalk posts but don't own the book! What a fun idea! 1 yard - not much and further more, I'll bet I wouldn't have ufos from this. Perhaps I should shelf the ufos and do this book instead and I'd also be ready for Christmas. What a deal! Would love to win, thanks for the chance! I'm the guild librarian and I bought this book for our library. I never get to read it, though, because it is always checked out! This looks like so much fun! I have a lot of one yard cuts waiting for inspiration ;-). This book would be best gift for any mom with little kids who have little or no time. Thanks for the giveaway.